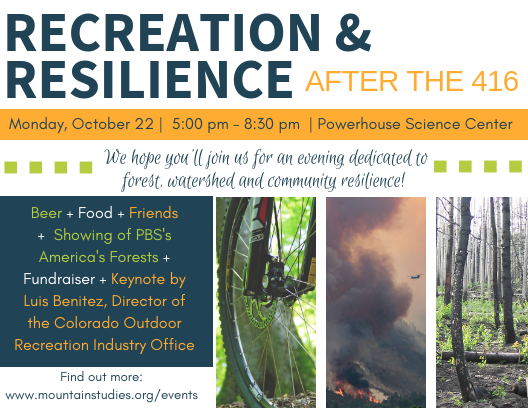 The recent 416 and Burro Fires and subsequent Forest closures around Southwest Colorado have sparked conversations about the relationship between forests, fire and community resilience, specifically through the lens of fire’s impact on recreation and economics. While a natural part of our ecosystem, recent fires also illustrated their power to reduce tourism, threaten homes, and limit recreation in prized public lands. Now is a critical time to nurture conversations about how we can unite around a future more resilient to fire. During the discussion, we aim to highlight innovative options for supporting conservation through recreation, promote local engagement in forest and watershed health, and connect community members with diverse resources. Mountain Studies Institute (MSI) and partners hope to bring stakeholders together from across our impacted communities, from mountain bikers and land managers, to anglers and business owners. o How can we support economic development through forestry or recreation, while improving the health and resiliency of our forests? o How should we improve our neighborhoods, adapt our economies and recreational use, and conserve our natural resources to mitigate the impacts of fire? o How do we nurture community support for land management that promotes more resilient forests and watersheds?